D'Entrecasteaux, the first vessel in the B2M class, entered sea trails in October 2015. Image courtesy of Ministère de la Défense. The second B2M vessel, Bougainville was launched in March 2016. Image courtesy of Ministère de la Défense. The D'Entrecasteaux multi-mission vessel was launched in August 2015. Image courtesy of Julien1978. The hull of B2M class is of steel construction. Image courtesy of Julien1978. The B2M (Bâtiment Multi-Mission) class multi-mission, ocean-going vessels are being built by Kership, a joint venture between Piriou and DCNS, for the French Navy. They are intended to replace BATRAL-class light transport ships. The vessels are designed to carry out missions such as maritime surveillance, policing, and monitoring and protection in the overseas territories and exclusive economic zones (EEZ) of France. They can also be used to combat illegal activities such as drug trafficking, illegal immigration and piracy. Civil missions of the vessels include humanitarian assistance, pollution control and fishery protection. The French defence procurement agency Directorate General of Armaments (DGA) awarded a contract to DCNS and Piriou for the construction and delivery of three multi-mission vessels, along with providing associated maintenance services in December 2013. The contract also includes an option for the fourth vessel, which France made a decision to build in May 2015. As the lead contractor for the B2M programme, Piriou will carry out design and construction of the ships in Concarneau. DCNS is responsible for military studies, and supply of onboard communications systems (SITIP) and in-service support (ISS) for the vessels for six years. Keel-laying of the first vessel, designated D’Entrecasteaux, was held in May 2014 and the launch took place in August 2015. 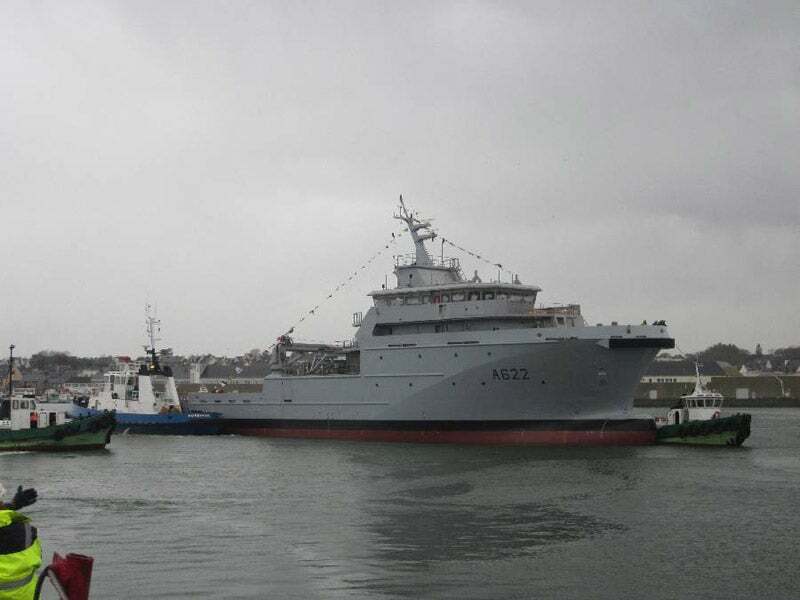 The vessel will be based at Noumea in French Caledonia and entered sea trials in October 2015, where it was received by the French Navy in March 2016. Bougainville, the second vessel in the class, entered construction phase in 2015 and was launched in February 2016. It is expected to be commissioned in the fourth quarter of 2016 and will be homeported at Papeete in French Polynesia. The third vessel, Champlain, will be commissioned in the first quarter of 2017 and will be based in Reunion. The fourth multi-mission vessel is expected to be commissioned in 2017. The 65m-long, 14m-wide B2M-class features bulbous bow. The hull is of steel construction, while the superstructure is made of aluminium. The multi-mission vessel is manned by 20 crew members and can carry up to 20 survivors or refugees. It has a standard displacement of 1,500t and a full-load displacement of 2,300t. Command and control of the vessel is executed from the navigation bridge located above the main deck. Fitted with large windows on all sides, the bridge offers a 360° panoramic view of the sea. The B2M-class houses telemedicine facilities, medical area with treatment room, operating room, and storage areas for containers and two 4×4 fully-equipped vehicles. The large, open deck area at the aft of the main deck supports logistics operations. A 17t crane is installed at the rear for lifting containers and equipment. The vessel is attached with a winch to tow and help distressed vessels. It can carry two speedboats to support the duties of police forces, as well as an 8m-long pleasure craft to disembark personnel and freight. The vessel’s flexible design allows for the installation of various optional systems. It has the ability to deploy divers for underwater intervention. The B2M-class is armed with two 12.7mm x 99mm (.50-calibre) machine guns and two water cannons for protection from fire. Each vessel is equipped with two QUADRANS fibre-optic gyrocompass and motion sensor systems, two independent warfare navigation software suites, one NETANS data distribution and processing unit, and multiple navigation sensors. "The vessels are designed to carry out missions such as maritime surveillance, policing, and monitoring and protection in the overseas territories and exclusive economic zones (EEZ) of France." The antennae, marine radars and communications are located on the vessel’s bridge roof. The B2M-class is powered by two diesel engines, driving two four-blade propellers. It can sail at a speed of 15kts and can stay afloat for up to 30 days without refuelling. It has a draught of 4.2m and is capable of towing 20t of loads from a fixed point. SLCE Watermakers was chosen to supply two reverse osmosis (RO) units for the multi-mission vessels. Sirehna provided EasyDP® Dynamic Positioning systems. In January 2014, Kership selected ENGIE Axima to deliver HVAC (heating ventilation and air conditioning) systems for the B2M ocean-going ships. iXBlue was selected by Piriou for the supply of navigation suite QUADRANS in October 2014. BIO-SEA by BIO-UV provided BIO-SEA100 systems to treat ballast water. The DCNS Group is a front-ranking European player in the world market for naval defence systems.